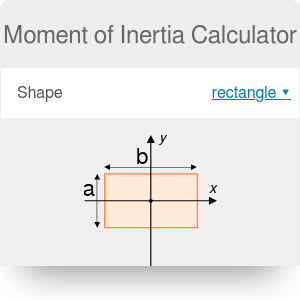 If you have trouble with determining the second moment of area of any common shape (like a circle or a hexagon), this moment of inertia calculator is here to help you. You will also find the moment of inertia formulas here - read the description below to make sure you are using them correctly! We will explain how these formulas work, so that you won't have to wonder how to calculate the moment of inertia of a rectangle ever again. What exactly is the area moment of inertia (also called the second moment of area)? It is a geometrical property of any area. It describes how the area is distributed about an arbitrary axis. The units of the area moment of inertia are meters to the fourth power (m^4). We can distinguish between the moment of inertia about the horizontal x-axis (denoted Ix) and the moment of inertia about the vertical y-axis (denoted Iy). We usually assume that the "width" of any shape is the length of the side along x-axis, and the height - along y-axis. Generally, finding the second moment of area of an arbitrary shape requires integration. You can use the following equations for the most common shapes, though. Remember that these formulas are true only if the origin of the coordinate system coincides with the centroid of the area. In other words, if both the x-axis and the y-axis cross the centroid of the analyzed shape, then these equations hold. a is the distance between two parallel axes. To find the area of a circle (and its other properties as well), use the circumference calculator. Moment of Inertia Calculator can be embedded on your website to enrich the content you wrote and make it easier for your visitors to understand your message.